Behavior One of my guinea pigs randomly goes into what we call "statue mode"? 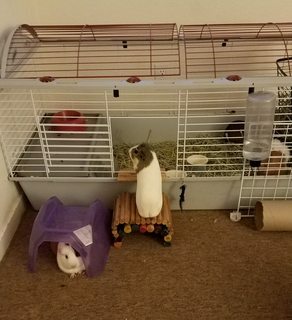 Behavior: One of my guinea pigs randomly goes into what we call "statue mode"? Thread: One of my guinea pigs randomly goes into what we call "statue mode"? One of my guinea pigs randomly goes into what we call "statue mode"? She's 100% normal and happy otherwise. Eating, drinking, pooping just fine, has lots of energy, etc. Just... sometimes I'll walk into her room to see her standing halfway up her little stairway or something and frozen completely solid. Not scared though, almost like she's just zoned out or sleeping or something. But once she "snaps out of it" she completely returns to normal. Re: One of my guinea pigs randomly goes into what we call "statue mode"?